I really need to thank my family as I share this recipe. They've had to put up with the house smelling like curry three nights over the past week as it took me three takes to get this recipe how I wanted it. On my first attempt, the flavour was just what I was aiming for but I didn't have the rice to liquid ratio right so the rice was too firm. The second attempt was in the slow cooker and the rice was too soft. But I'm so glad I persevered because take three - back in the oven with a long grain brown rice that holds up well to the long cooking time - resulted in serious yumminess cooked just right. 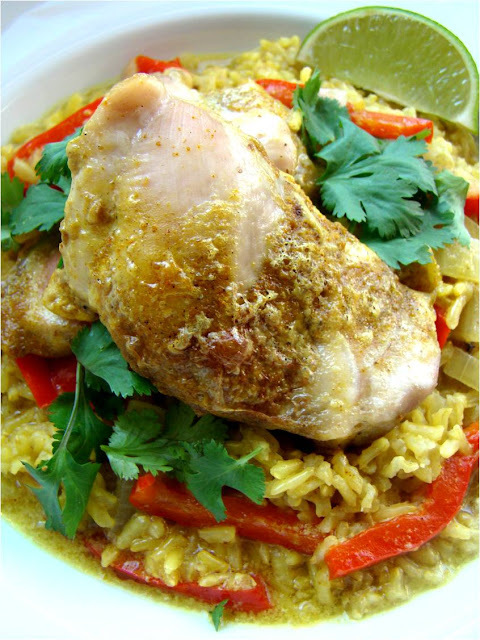 Tender chicken and nutty brown rice baked in a silky coconut curry sauce. Mmm delish! While the oven preheated to 350 degrees (F), I sprinkled the rice evenly in the bottom of my largest ceramic casserole dish. Then the onion and red pepper were layered evenly on top of the rice. 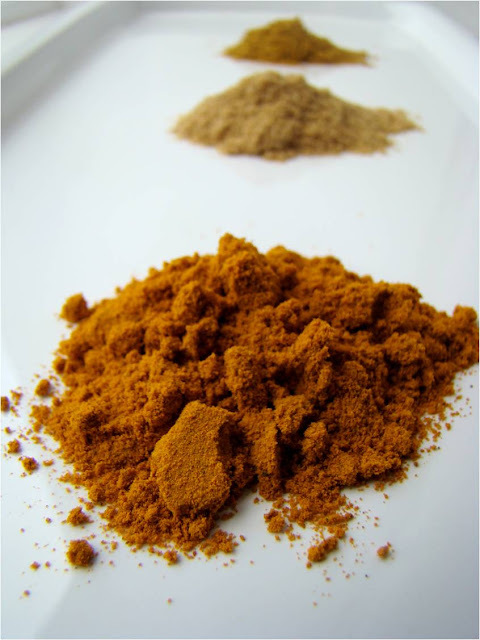 In a medium mixing bowl, I whisked together the coconut milk, water, curry powder, coriander, turmeric, and ginger. I poured about 3/4 of the mixture over the rice and vegetables. The chicken thighs were then placed in an even layer on top of the whole thing and the remainder of the sauce was poured over the chicken. In it went in the oven, uncovered, for 1 hour and 15 minutes until the liquid was mostly absorbed. I could have made a chicken coconut curry with the rice prepared separately just before serving. But for a busy family cook, that's like making dinner twice! 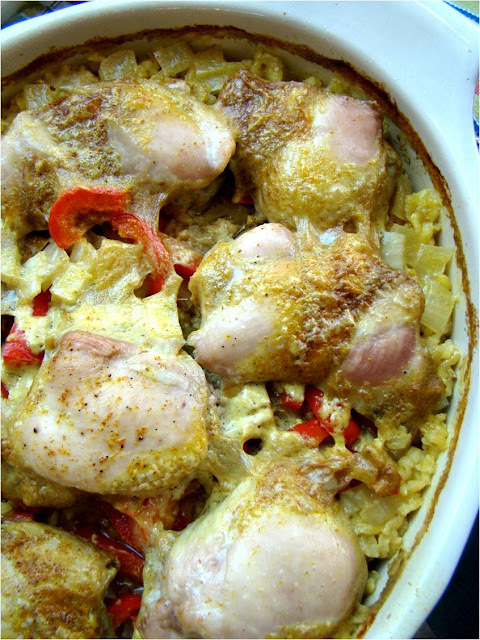 I was determined to make this a simple to prepare all-in-one chicken and rice casserole. And I am so making this again soon. My poor family! Are you a fan of coconut curry flavours? What do you make that your family gets tired of? Do you make it anyway like I do? Tee hee! Adding this to our must eat list! So yummy! Does little R eat this? If so, I'll trade ya peeps. Ha, Jen! Ya right. He will take little bites of the chicken and eat the lime wedges and I'll give him some raw red pepper, but that's as close as it gets. As long as he has a taste, I'm okay with that. Mmm. Love the one pot wonder. Looks delish. I've made this 3 times. Easy peasy every time... and delish enough that the kids (actually) comment that they like it! I am assuming it would be fine to use boneless, skinless chicken breasts in place of the thighs...? Or even cut into smallish pieces?! Hmm... good question. You might be able to substitute quinoa for the brown rice as long as the quinoa doesn't go mushy from the long cooking time. If it were me, I'd pull the dish out of the oven once the chicken is cooked through and check the tenderness of the quinoa. do you have to cook the rice before hand? or can you put non-cooked rice in the casserole dish? 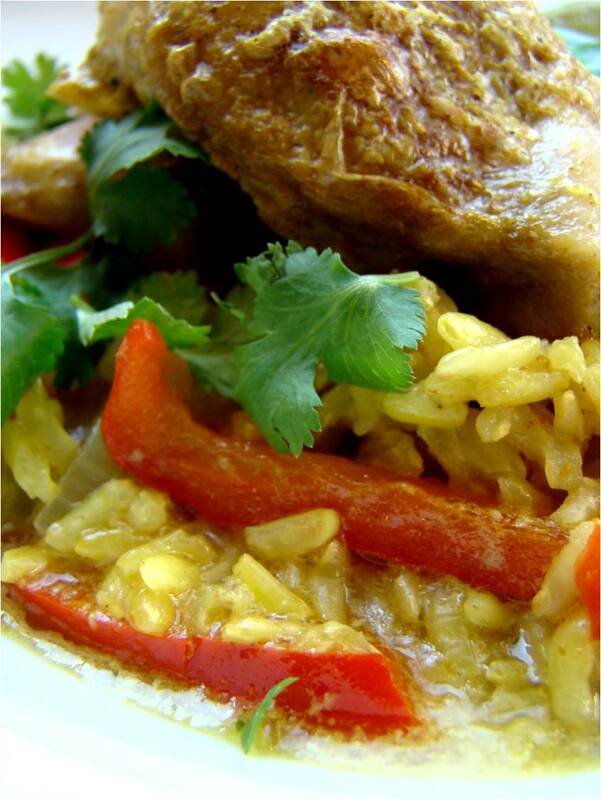 The rice goes into the casserole dish uncooked for this recipe. One less step to fuss with! Just thought I'd let you know that I made this for the family and it was a hit. My sister also made it and yesterday my husband made it for his crew on the tug. Today I was stopped by a friend at the grocery store and she asked me to send her the recipe. I love how easy it is to throw together. I'm all for that! Thanks for the inspiration to our dinner tables! What a lovely comment! You just put a huge smile on my face. Thank you, and you're welcome! I'm going to try the lime coconut chicken one next. I'm looking forward to it! Hi! I love this recipe! Ive made it a couple of times. Does this work with white long grain rice? I suspect it would work fine. Just check to make sure the cooking time on the package is the same for the rice you've already been using. I'm glad you like it! This is delicious and so easy. Exactly the prep ahead quick dish this momma of 3 needs! Thank you!